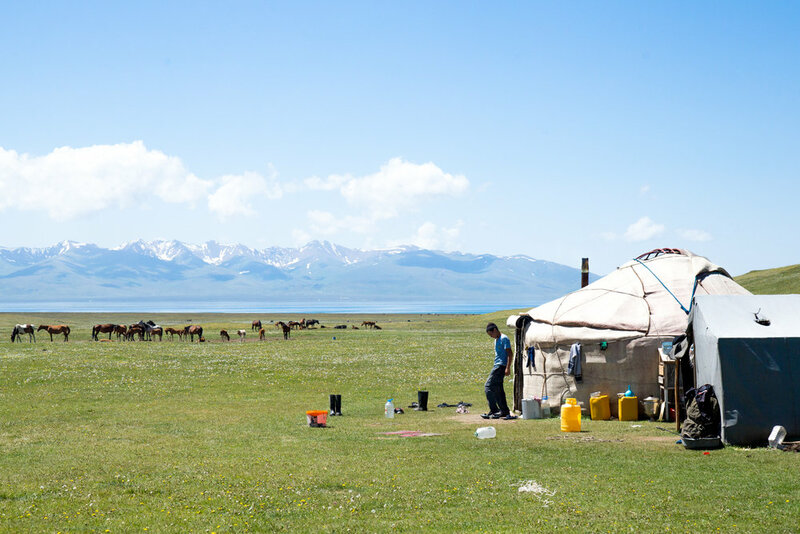 In the summer of 2017, she set off to Kyrgyzstan to roam the central Asian plains and mountains equipped with a heavy backpack loaded with all the camping gear necessary for the month-long journey. In the meantime, I was in Beirut, breathing humid air, thick with the dust of a thousand construction sites spread throughout the congested city - waiting for my next project to materialise. A miraculous stroke of luck catapults me to Bishkek, the capital of Kyrgyzstan, to join the trek for a solid ten days. Straggling behind, heaving my camera gear, I followed her through pine forests, up rocky hills, and past receding glaciers. One day we decide to head to Song Kul, a lake tucked away beneath snow-speckled peaks.